Food transportation. It’s the curse of the modern world. Just think how much brighter and sunnier the planet would be if we all shopped locally, tootling along on our bicycles to pick up freshly-baked bread and a dozen eggs just as our grandparents would have done. A brave new world unemcumbered by gas pumps and trucks. Except…. Well, no. It’s not that simple. In many cases, transport is a tiny proportion of total greenhouse gas emissions per unit of food – for example, it’s less than 1% of the carbon footprint of one lb of beef. However, food miles are often cited as an environmental proxy to differentiate between food choices, the assumption being that an egg which travels 2,000 miles across the country is less environmentally-friendly than one produced in the next county. Indeed, one farm website proclaims that “We do not ship anything anywhere. We encourage folks to find their local producers and patronise them”, while on the same page, a customer testimonial proudly proclaims: “I drive to <Farm X> 150 miles one-way in order to buy clean meat for my family”. Given the dichotomy between these two statements, let’s compare buying eggs from a grocery store with a local farm (full analysis here). 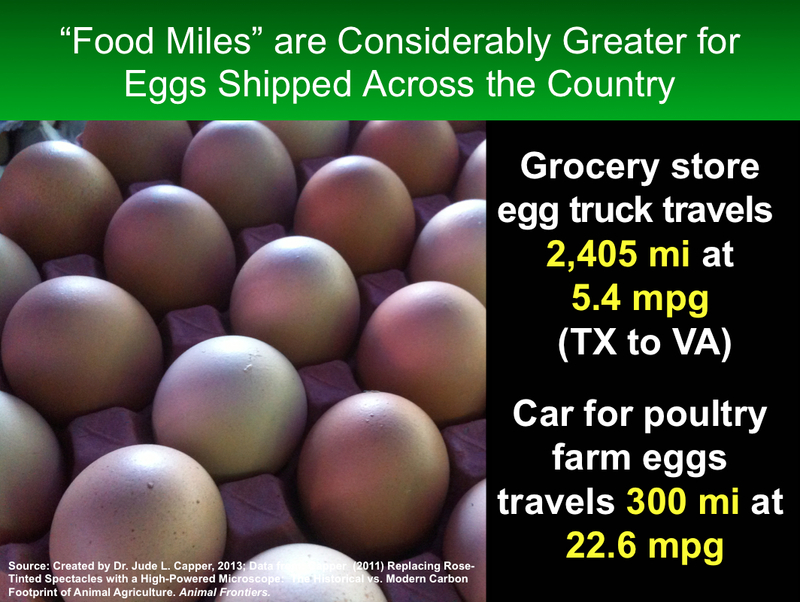 Food miles are far greater for eggs that have traveled from Texas to Virginia to be sold in the grocery store (2,405 miles round-trip), compared to driving to the local farm (300 miles round-trip); and the fuel efficiency is far worse for a truck (5.4 mpg) than a car (22.6 mpg); yet a modern truck can carry 23,400 dozen eggs. Unless your car is packed to the roof with eggs, traveling to the farm to buy them emits 55X more greenhouse gas emissions than driving to the store to buy them. Bottom line? Unless the local farm is closer than the store, or you’re able to walk/cycle there*, it’s more environmentally-friendly to buy eggs from the store, because the greenhouse gas emissions attributable to one dozen eggs out of 23,400 dozen is a tiny fraction of the total. One report claims that greenhouse gas emissions from one large container ship is equivalent to 50 million cars – however, in this instance it’s the result of sulphur dioxide emissions from poor quality shipping fuel rather than inefficiency. Mass transport may not have a feel-good factor associated with driving out to a farm, but it allows us to enjoy a wide variety of affordable foods with a low carbon footprint – essential factors for a sustainable food future. This entry was posted in Carbon Footprint, Eggs, Fuel, Fuel Efficiency, Greenhouse Gas Emissions, Grocery Store, Local Farm, Local Food, Shipping, Sustainability, Transport and tagged Carbon Footprint, Eggs, Environmental Impact, Food Miles, Food Transport, Fuel Efficiency, Greenhouse Gases, Grocery Store, Local Food, Locavore, Mass Transport, Shipping, Sustainability, Trucking. Bookmark the permalink. Hi Jude, Local…another fine post by you – with sarcastic wit – about another misused word. Organizing writing effectively is hard. Humor does not come easy. I recognize and enjoy talented writing when I read it. Our state is trying to pass misguided local agricultural products labeling regulation. I responsibly weighed in against it: http://sustainable-farming.rutgers.edu/legislating-the-lust-for-local/. 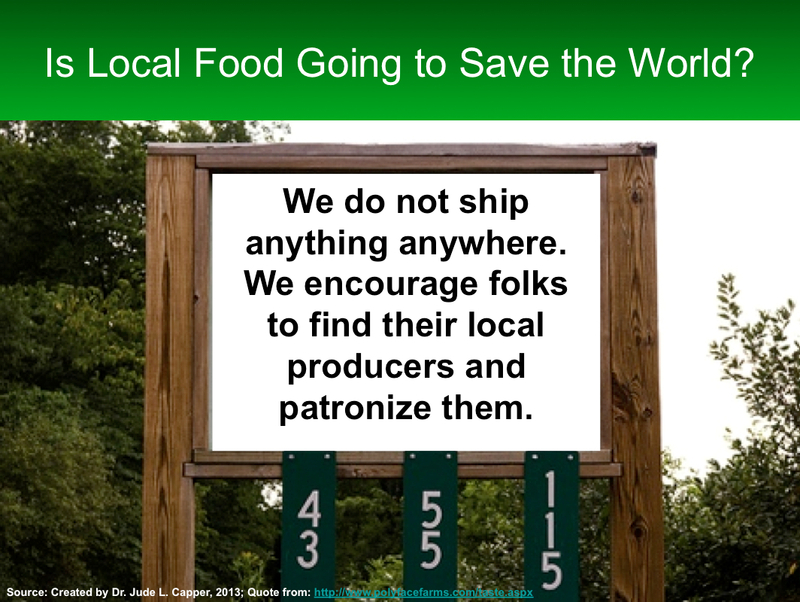 There is a link about William Safire’s tracing the origin of the word locavore in 2007, and a link about how a small percentage of privileged consumers use the phrase ‘local food’ as a political economy proxy. Local naively means using food purchasing power as a form of political expression; against technology, against efficient business globalization, against larger businesses, and for a small is beautiful romantic notion of farming free from competition. The phrase carbon footprint may be thrown in, but never analyzed. I enjoy your writing and hope your health is good. Keep it up. Thanks Jack! Nice article – I’m amazed by the “locally grown in…” legislation. Surely that’s nonsensical? After all, one cannot grow something other than locally to where the field/orchard/vine is located? I’m all for buying foods and other products that appeal to my sense of “This is how X should be produced” but not when it comes at an environmental cost. Hello- I enjoy reading your posts, as they align with my thinking most of the time, and are chock full of good links. However this one seems to be a bit shortsighted. We all know the farm you are referring to, and while they do have customers that drive insane distances to buy their products, I think that is an outlier in the local food movement. While calculating the carbon emission differences between this single car trip vs. mass truck transported eggs may give the impression that grocery store eggs from warehouse-grown hens have a smaller carbon footprint, it ignores the carbon sequestration done on that particular farm though rotational grazing and pasture based agriculture. We do need to work on the distribution inefficiencies in the local food systems, as well as realize that some products will have more miles on them then others simple because they can not be grown in the area. However eggs in particular can be grown anywhere at anytime, and are a good starting point at reducing the total miles in our diet. If regional food aggregation hubs and distribution networks are allowed to grow, and regulation becomes easier on the local producer to get their products into stores,we will see far fewer people making the 150 mile trip for a few broilers and a couple dozen eggs. Thanks for the good posts, I just had expand this one! David- Thanks for your comments and glad you enjoy the posts! Yes, I absolutely agree that a 300-mile round trip is fairly insane to buy a dozen eggs. Having said that, the original analysis was expanded beyond that described here (I summarised it in this post for the sake of brevity) to include a Buyer’s Club scenario (again, less efficient than the mass-transported eggs because of the reduced capacity of a pick-up truck vs. a truck) and also to look at the distance that the local farm would have to be from home in order to make it a more environmentally-friendly choice than mass-transported eggs. I don’t have the model in front of me, but over 90% of the fuel emissions associated with the mass-transported eggs were attributed to the consumer driving 2 miles to the store to buy them, with a very small % attributed to the trucking itself (again because of the truck carrying capacity). 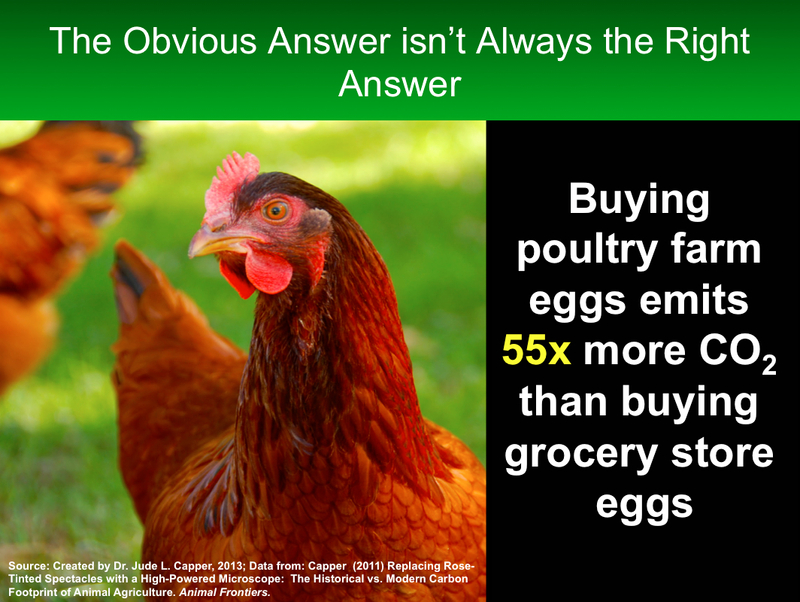 The analysis showed that unless the farm was closer to home than the grocery store or unless the consumer was buying huge quantities of eggs, there was no advantage of buying on-farm eggs because of the relative proportions of consumer car emissions vs. truck emissions to the total. While the farm would undoubtedly be closer than the store for some consumers, it certainly wouldn’t be standard. I visited the farm in question several years ago. While they are certainly great marketers, I saw little evidence of the poultry contributing significantly to carbon sequestration, especially given that they were being supplemented with bought-in grain. Furthermore, the fact that the cattle took anywhere from 22-30 months to finish (and some didn’t finish at all) would have a huge impact in terms of increasing greenhouse gas emissions per unit of beef produced – far more than could be outweighed by carbon sequestration into pasture. Totally agree that we need to improve efficiencies throughout the system, and realise that although we might want more “local” foods – we either have to accept that mangoes don’t grow easily in Montana, or go without!